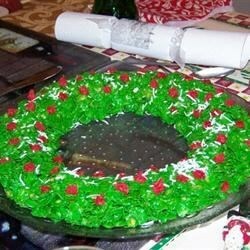 "With this recipe, you can make wreaths using cornflakes. They're fun to make and eat. Get the kids involved and make an afternoon of it!" Melt margarine in a large pan over low heat. Add marshmallows and stir constantly until marshmallows melt and mixture is syrupy. Remove from heat. Stir in food coloring. Add corn flakes and stir until well coated. Serve a taste of tradition with these light, buttery cookies. I make apx 50 types of cookies for xmas-this one is really easy, really fast, really good tasting, and looks terrific on the platter!! !